Over the last couple weeks, we’ve looked into ways to keep your doggie safe during the cold season. Today we will finish the trilogy with on a strong note. As Cincinnati’s premier dog training organization, the Dog Wizard strives to enrich lives through proper training techniques. From dog aggression training to German Shepherd puppy training, we cover it all. We believe that both master and pet can enjoy their time to the fullest in the outdoors. When those outdoors consist of ice and snow, though, things get complicated. 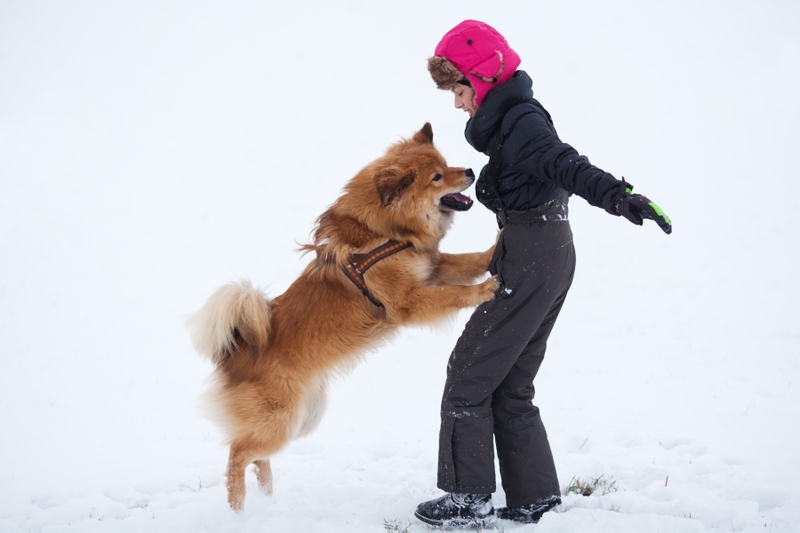 Our advice for winter dog care comes down to one core concept — paying attention. The most important thing you can do to ensure your dog is doing okay is to watch their behavior closely. If your canine seems to be limping or running in a strange manner, check the paws. Cold temperatures can increase the chances of your dog’s paws cracking and bleeding. Make sure their pads are healthy and free of debris or ice. If your pup ails from constant paw damages, buying booties may not be a bad idea. Some people find it fashionable! A big factor you need to watch for in dogs is the threat of hypothermia. Pet MD states that canines with mild hypothermia will display weakness, shivering, and a lack of mental alertness. These behaviors can also involve whining and constant stopping. If your dog starts to display these symptoms, make sure to get them inside to be dried and warmed up. If action is not taken in a quick enough manner, your pet can suffer serious consequences. Based on the severity of hypothermia, a veterinary visit may be mandatory. The key to avoiding this is to pay close attention to your doggie during times of freezing temperatures. The Dog Wizard offers high-quality obedience training for dogs. We would like to think we have the best program for dog training in the Cincinnati area. We love dogs! Part of our commitment to canine excellence is our efforts to making sure the pooches in Cincinnati are safe. From being locked in a hot car to being left out in the cold, canines can face a lot of dangerous situations. Putting in the effort to keeping your pup safe can go a long ways. Canines are man’s best friend, and we believe that is a two-way street. When you take care of your best friend then they will take care of you. If you’re interested in the aforementioned dog obedience training classes, don’t hesitate to contact us today!